I met Oliver Sacks only once, after the publication of The Man Who Mistook His Wife for a Hat. I remember him politely chatting with admirers at a book signing party at my father-in-law’s bookstore in Chicago. Although I had read just about everything he had published at the time, almost in the deep way one reads in childhood, I was surprised by his appearance—his bushy, Walt Whitmanesque beard; his rumpled white shirt; the breadth of his forearms and the barrel of his belly as he reclined on a chair by the round table at the back of the shop. I was too confused to say more than a shy hello because he wasn’t at all how I’d imagined and I was embarrassed by my mistake. I had made up in my mind a picture of the writer of those scrupulously intelligent, original and wise books, and it didn’t match. I should have paid better attention, I thought. 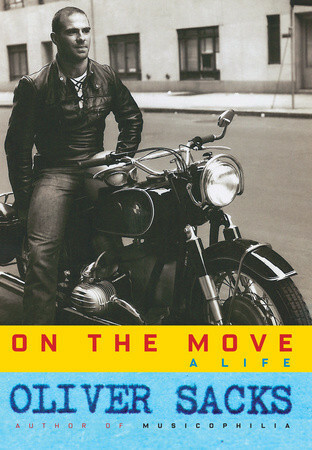 On the Move is an autobiography constructed from diaries, letters, photographs, and passages excerpted from Sacks’s previous books. It was written when he knew he had cancer in one eye but before it had metastasized. In it he writes for the first time, and freely, about his homosexuality, as he later put it, “with no more guilty secrets locked up inside me.” Though there’s overlap, this new volume begins where his childhood memoir Uncle Tungsten ends. Uncle Tungsten was about a love affair, the pure and foundational sort one has during latency — in his case, with the sciences, and with chemistry in particular. It ends when he is fifteen years old, when he no longer experienced those “sudden raptures of the mind.” That first memoir is anchored in the settings of his Anglo-Jewish childhood, framed by the figures of his mother, father, and three brothers as well as the many members of his large, extended family (with 18 siblings in his mother’s family and four in his father’s, there were nearly a hundred cousins). A good portion of the book is set in Jewish, middle-class Cricklewood, where his parents, both doctors, had a rambling house large enough to accommodate family and consulting rooms as well as sundry visitors. The Walm Lane Synagogue was walking-distance and most of the shopkeepers, including pharmacist, grocers, and kosher butcher, were members of the congregation. On the Move is organized around Sacks’s quest for physical and mature love. It’s about leaving home and the divergent, sometimes vagabond, life Sacks made in the United States, a more open world than England in the 1950s. It shows the clumsy and creative way he replaced the steadfast presences of childhood, his Auntie Birdie (Zipporah) or Uncle Tungsten (Dave), with an assortment of friends, ranging from derelicts like Larry, a sweet and pure “mad tramp,” to W.H. Auden. There is a seeming transparency in the prose in this new volume, which is looser and structured more as a series of vignettes than his earlier works. He doesn’t hesitate to tell a story when the joke’s partially on himself. In the first chapter, for instance, he remembers unintentionally outwitting British customs by sipping an entire liter of 100-proof aquavit during a ferry trip home from Norway. Then, when the boat was docked, he literally fell on his face and had to walk on deck with ski poles. The guileless humor, in this case slapstick, camouflages pain that is just beneath the surface. The book is about exile and loneliness as well as a quest for love, and the sad, human mistakes that happen along the way. Sacks left England on his 27th birthday—“leaving the nest,” as he puts it—for many reasons, including the fact that there were so many members of the family who were London doctors (the list included his mother, father, brother, uncle, and three cousins). In a journal entry he made during the first few months of his journey, when he was traveling through the Canadian Rockies, he looked back to his routinized London family and Jewish life with a mixture of nostalgia and ambivalence, distancing himself even through diction, avoiding the Yiddish word yarmulke or the more forthright English skullcap: “On a summer evening, at home, the setting sun is lighting up the hollyhocks and the cricket stumps stuck in the back lawn. Today is Friday, and this means my mother will light the Sabbath candles, murmuring as she cups the flames a silent prayer whose words I never knew. My father will don a little cap and, lifting the wine, will praise God for his fecundity.” Sacks attributes his “raging atheism” and “fury with God for not existing” to the horrors of the war. Like many children, he was evacuated from London in 1939. With his older brother, he was sent to a boarding school, a real version of the fictional Dotheboys Hall, run by a sadistic headmaster. Somehow, during the trauma of that experience, the early bond to religion was irrevocably broken. His skepticism extended to a rejection of religious zealousness and a distaste for Zionism, although he spent the summer of 1955 at the “Anglo-Saxon” kibbutz Ein HaShofet and Abba Eban, the famous Israeli diplomat, was his first cousin. It wasn’t unusual for his generation of British Jews to turn away from religion or assimilate; membership in his parents’ synagogue began to diminish as soon as the war ended. But for Sacks there was another matter that caused the Judaism to seem oppressive. As the youngest and favorite son, he had always been doted upon by his mother, but after learning about his homosexuality, she was shattered. “You are an abomination,” she said to him, quoting the strictures in Leviticus. “I wish you had never been born.” Though Sacks attributed her reaction to her Orthodox and Victorian upbringing (and also to a fear that she was losing him), her darkly troubled face during that horrifying moment —he called it “a face of thunder”—inhibited him for decades afterward. There are many confessions (and some comeuppances) in On the Move. Most poignantly, Sacks acknowledges that part of what drove him to leave England was his schizophrenic brother, Michael, “my tragic, hopeless, mismanaged brother.” Anyone who has lived with an afflicted family member knows the stresses he was escaping, the frightening identification and guilt, the barriers to intimacy. As a clinician exploring brain-mind disorders, Sacks’s genius has been the ability to pay attention, to let his patients and his friends teach him, and to acknowledge their beautiful and creative compensations. These are insights developed while on the move, in the restlessness of intelligence—as Thom Gunn put it, “One is always nearer by not keeping still.” On the Move, wittily and wittingly, holds in its title the darker meaning of our human movement and the author’s deep consciousness of his own journey towards death and final resting. Characteristically, he maneuvers with nonchalance, disguising the difficulties with the grace of his prose. Marvelous, insightful review, and a fitting tribute to an extraordinary man. I enjoyed it thoroughly.